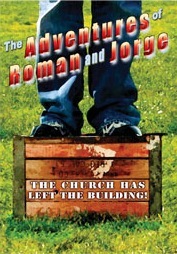 The Adventures of Roman and Jorge is a series of fictionalised stories of two Christian men in their early thirties who begin to get out and share their faith for the first time. Episode 1: So a Guy is Walking Off a Cliff . . . Episode 2: Yes, You’re Right . . . It is Preachy Episode 3: Then Comes Marriage Episode 4: Yeah, That Doesn’t Sound Too Friendly . . . (NEW) NEW EPISODE! Episode 4 finds Roman and Jorge at odds with the Bible club at their old high school, but the frustrating meeting leads Roman to an unexpected witnessing encounter on public school grounds. Meanwhile, Jorge is more than troubled when he discovers his estranged wife, Lisa (new cast member Linda Isai), has a new neighbour.